The bark is stripped away to reveal the bare wood underneath. This is scorched with a flame to bring out the beautiful pattern of the grain and then the stick is polished. 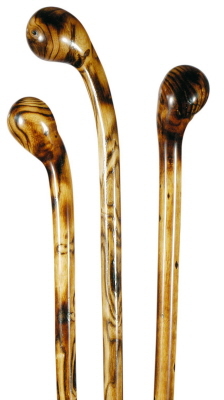 They are grown in the woodland of Classic Canes, in Somerset, England. Height 92cm (36"). Fitted with a metal ferrule.